The Rev. Fr. 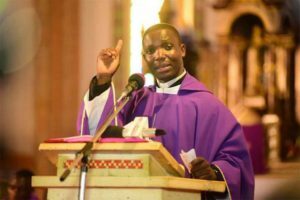 Deogratias Kateregga Kiibi, a youthful Rubaga Cathedral priest, who took the country by storm when he gave a lively truth-to-heart homily during the Requiem Mass of singer Moses Ssekibogo a.k.a Mowzey Radio, says he could have become a doctor . The third in a family of 14, did not mince words as he stated the realities that celebrities go through, how they handle fame vis-à-vis what is expected of them by God and how they lead lavish lifestyles only to be exposed when misfortune knocks on their door. 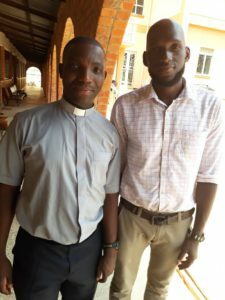 PML Daily’s Shaban Lubega had a one-on-one with the youthful priest and here are excerpts from their interaction. Fr. Kiibi like you call him goes by the name — Deogratius Kiibi Kateregga, born in the late 80s and a Catholic by religion. I am a third born in a family of 14, consisting of seven girls and seven boys. I have lived in the village and town, so I can gladly say that I have experienced both lives. I don’t want to give so much details about my profile because I am still a young man. Can you tell us more about your siblings? Like i said, I have seven sisters and seven brothers. One brother is a seminerian and two of my sisters are nuns. How about your dad and mum? I am lucky both my parents are still alive. My dad is Augustine Kateregga, a professional doctor working in Kalisizo Hospital. He is aged 58 and has been head of the laity for a deanary for a long time hence being a “Sabakristu.” My mum,Ms. Teddy Nabayunga is the head of the married people in my sub-parish. They have been married for close to 40 years and are a great inspiration to me and my siblings. How far did you go with education? I have had all my education in a seminary setting which has moulded me into the person I am today. Apart from the primary school I attended in Mbuye, Rakai District which is also a school for Brothers, the rest are Seminary schools. Talk of Kisubi Seminary and others. All the Seminary schools are good and I urge parents to take their children to such schools because they put emphasis on both academics and morality. I have several first class degrees and currently I am at Makerere University pursuing a Masters in Journalism. Do you think you are now a celebrity? I am not a famous man or a celebrity. I preached recently and it is what sparked all this celebrity talk. Fame is measured from consistent and successful performances of a person which is not the case with me as per now. I don’t think one instance can make me a celebrity or a famous person. What is your view about marriage? Many young people fear marriage but the youth of today fear it more. Many young people have aborted like five times and will tell you that they are still young because they are yet to produce. People in the past were very careful and minded so much about their future. They would marry early and then settle down unlike today. My dad and mum produced 14 of us and are still taking care of some of us. These are the examples other people should emulate because my father is not very rich but he is a responsible parent. Nowadays, people fear responsibility but keep on acting. Why act when you cannot take responsibility. How long did it take you to prepare for Mowzey Radio’s homily? What I preached that day is an indicator that the seminary has prepared me well. No one should be surprised by what i preached because I am well grounded both academically and morally. I have four degrees, two diplomas and several certificates. I have been taught public speaking and I have always preached like that and at times people complain that I am preaching about them directly. Did you expect the reaction you got from the people after that day? I did not expect the homily to go so viral because that’s how I have preached all my life. Didn’t social life ever threaten to eat you up while growing up? Problems and obstacles have been there all my life but I am fortunate to have overcome them. Like any other young man, I met girls in school but it is all part of adolescence, thanks to the seminary, it helped me to have prudence in my self and have self control. I was not perfect but I made sure that those problems didn’t put me down. Even now I get the challenges but I handle them. I see women with revealing clothes some half naked but I think beyond their nakedness. Did you participate in any sports activities while in school? Yes, when I was young, I liked and played football but in secondary school, I concentrated more on academics. Later on in school, i tried playing basketball. What would you have been if not a preacher? May be I would have been a medical doctor because I always looked at my father as an inspiration and he is a doctor himself but all in all, God wanted me to be here. For how long have you preached and what else do you do? I have been a priest for three years, this is my fourth. I am also in charge of the choirs here at Rubaga. What are your views on the deceased Mowzey Radio? I have read he had five children at 33, his mother was not sure of the father which was not good for him. I had so much pity on Radio because he was just starting to establish himself. He was beginning serious work and had the potential. Between 30 and 40, is when you do most in your life. I very much liked his collaboration with Weasel. Mowzey was a talented vocalist and I am sure the world will miss him dearly. Which was you favourite Mowzey Radio song? Ngenda Mu Maso. It had a very wonderful massage for everyone because the best things in life are always in the future. Did you ever meet Radio before his vigil? I have been at one or two of his shows before but never met him in person. Of course I would have loved if I had met him in person because he was a celebrity and everyone loves to meet their celeb. Any message to young people? I want them all to be inspired and know that no one was meant to be a failure in life. God can pick you from anywhere but you should be ready because life and the future are both uncertain. You must have a dream and goals. You should also trust God to show you the way. I feel pity for those who have no God in them because they are lifeless. Young men and women must be persistent, never fall and stay down. You must work around the clock to find solutions for every problem. You should also begin and end the day with prayer. Have friends because they are so important in life. They are there in times of need but choose them wisely. And lastly, the youth should have many friends of their religion. Do you have anything to say to the celebrities that you may not have said to them that day? No. Because when I go to Mass and I conclude, that’s enough but they should know that when God lifts you, you should always remember him and stop going into hiding. All I said was so important to them and should get financial advisers. Radio should be an example to the Juliana’s, Chameleon, Bobi Wine and the rest. What is your social life like. I am a diplomat, so social and I have friends who at times invite me to their home although I set limits so I don’t socialise with everyone, I vet carefully. I am also a football fan and I have supported Arsenal since childhood. The problem is that I don’t have too much free time. I also rest and call friends in my free time. Finally, I also like reading newspapers and being on the internet. I am on Facebook and that day I delivered that homily, I received so many friend requests but I already had like 4,500 so I could not add many of them. Am also on Twitter and Instagram. What can someone do to be like you? You can never be like me because everyone is different. To be a preacher, go to the seminary, attend the lessons of preaching which we all attended. Will you attend Radio’s tribute concert that is if it ever happens? Yes I will if I am invited but also if I have time. Jesus Christs is my role model. Only God knows. I don’t know where I will be but I want to remain a good servant to God. I am yet to publish a book: “The epitome of success proceeding in the pipelines of effectiveness.” Its 266 pages. I read the lives of the most successful people in the world in the 21st Century. I am so sure people will like it. I have also written about academic success which I also know people will like.I want to be a better version of myself and ask God to help me achieve that. I would like to call upon all the youth never to give up in life and also avoid bad behaviour. I fear youth who do not fear to disappoint any one. I also fear youth who are lazy, don’t go to church, easily usable by anyone, indiscipline and those who do not fear HIV Aids. I urge all to get educated and should strive to improve in life. I pity those who are changing religion like nothing.